With Dwight Howard now on the Hornets, Peak could be facing a tall order with regards to footwear since Jordan Brand would likely rule their uniforms and kits. 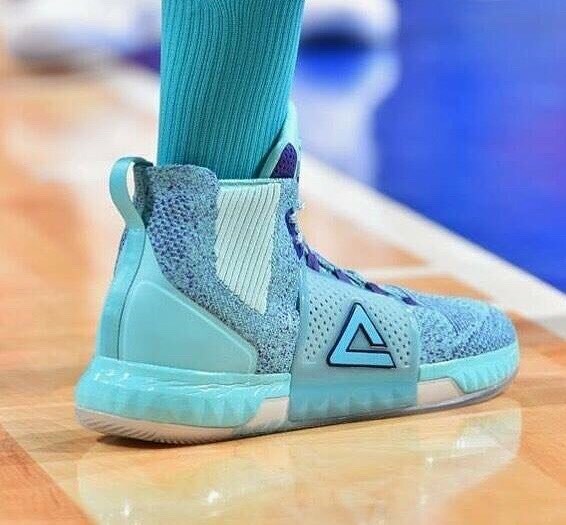 However, that doesn't stop the Chinese brand to showcase their latest kicks in Howard's signature line, the Peak DH3. Sporting a full-length knit upper, the Hornets' colorway highlights the shoe's tech perfectly well as the shades of turquoise and blue can be be very well seen on the textile upper. Also, the photo here features the regular version of the Peak DH3 and it would be also great to see the 3D printed midsole version as well. While no word yet with regards to its retail release, just seeing this design/colorway makes me more excited in seeing them in retail shelves. Will I cop them? You bet. But first, I have to get myself the DH2's first and do a performance review on that as well. That square part on the mid foot is a TPU piece foot lateral support and it's connected to the midsole.